This patterns fits 17" - 18" dolls like American Girl doll, Baby born and Alexander doll. Hello all of You! Christmas is on its way! We have all started preparing for Christmas now. We have a lot to do these days. We make coockies and tasteful food, and we fill our houses with lovely smell telling us that Christmas is coming! This is a lovely time when we are looking very much forward to Christmas! The time we spend together with family and friends! ... yarn and needles and do some knitting. 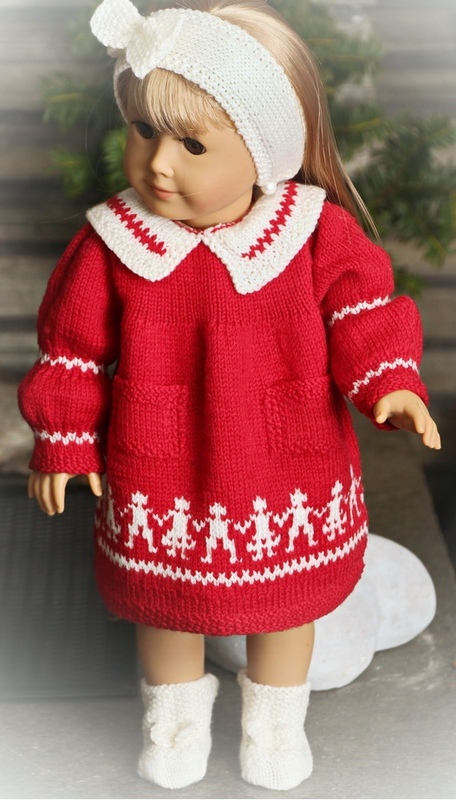 Why not knit beautiful Christmas clothes for our lovely doll Mari? Our doll Mari likes a lot to get new clothes for Christmas and she is so excited! My doll Mari is dressed in a coat and a hat to go for a party. When the clothes was finished and I dressed my doll Mari in these clothes I thought she looked so lovely. I think it is lovely to have a coat and a hat that fit the Christmas clothes. Then I thought it would be nice to knit her a red coat and a hat to wear outdoors during Christmas so here you are! As you can see yourself my doll Mari is beautiful dressed for coming Christmas! 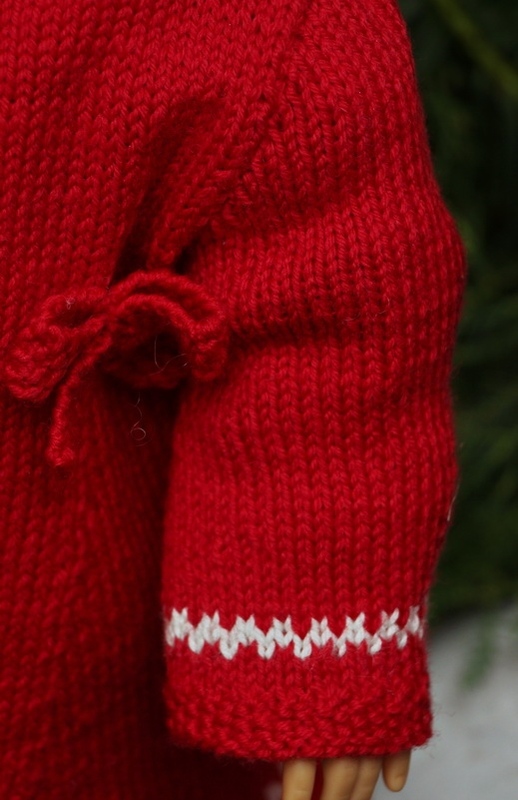 I hope you will like to knit these clothes for your doll! The hairband is also knitted in white with moss stitch edges and a larger bow knitted in moss stitch sewed on the hairband. 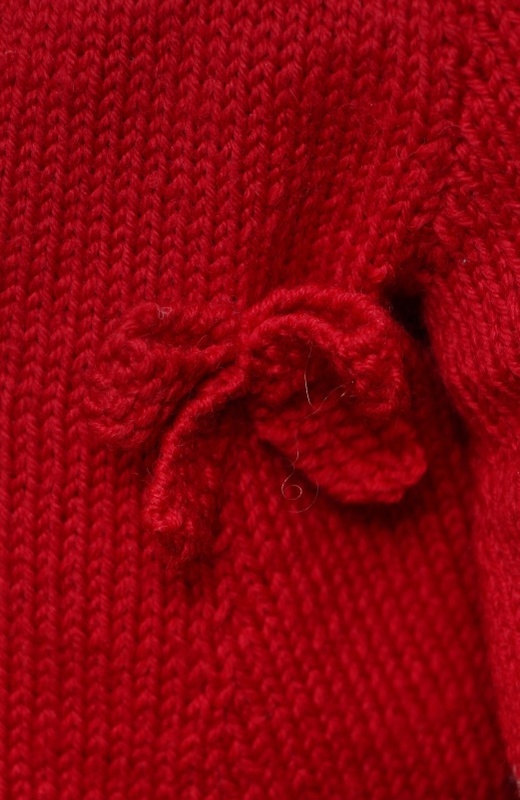 ... and a little bow knitted in moss stitch sewed on the flap. 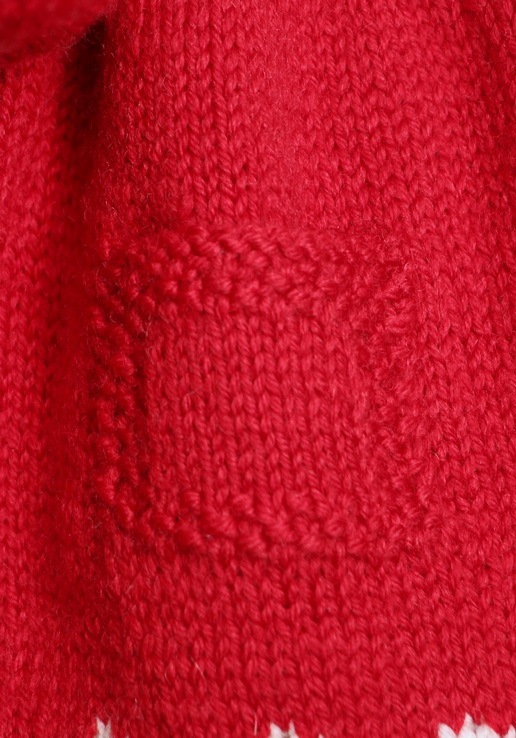 On the front of the dress I have knitted two small pockets. Da klærne var ferdig, og jeg så hvor fin Mari dukken min var blitt i disse dukkeklærne, bestemte jeg meg for å strikke henne en kåpe med lue som tilbehør. Det er alltid flott med uteklær som passer fint til det antrekket som er under. I have knitted the collar in white with edges knitting in moss stitch. 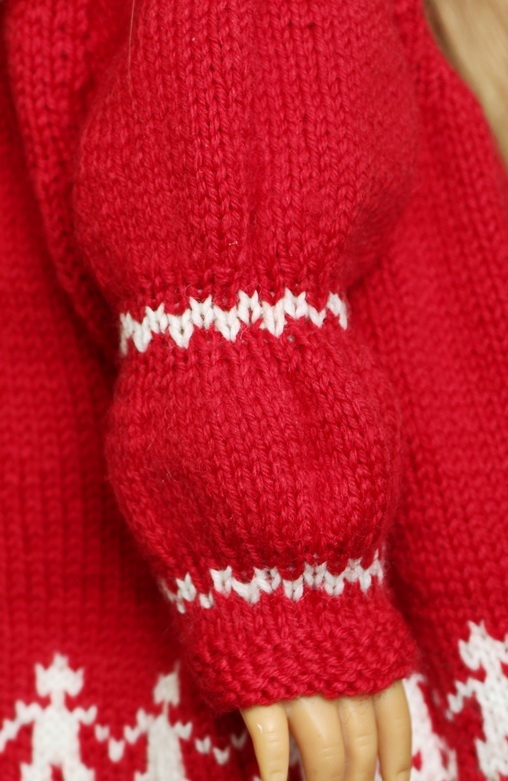 Along the collar there is a small red border inside edge stitches. At last I knitted her a pants.